Oman is the perfect place to go if you like road-trips, camping, and FREE camping. That’s right, free “wild” camping is a thing in Oman, and you can camp just about anywhere that isn’t private or protected land. Oman is a sparsely populated place, so that leaves you with a lot of options for places to camp… unbelievably beautiful places like nowhere you’ve ever camped before! So not only is camping free and beautiful in Oman, but it is also very safe. Oman is the safest country in the Middle East. Not only is is safer than any country in the Middle East, [according to the Global Peace Index] Oman is safer than many countries that most of us wouldn’t hesitate to visit; like Greece, Thailand or the United States. Crime targeted at people, and tourists is extremely rare, and uncomfortable and annoying behavior towards women isn’t a thing in Oman (culturally/religiously, harassing, or even “checking out” women is not tolerated——YAY!). I literally felt as at ease as I did traveling around Switzerland. Also, Omani people treat foreigners with a level of kindness and hospitality that is incomparable to anywhere I have ever been. So Oman is safe, beautiful, camping is free, people are friendly and eager to meet and help travelers… could it get any better? Yes, to top it off there are. literally. camels. everywhere... Wild camels (also goats, which are cute too). I really didn’t do that much planning for Oman, aside from reading a few blogs to get an idea of a few places I wanted to check out. I intentionally kept my plans open, because I wanted to take full advantage of the freedom that wild camping offers. I booked one night in a Sheraton hotel in the capital city of Muscat (I had credit card points to use, otherwise I would have opted for a cheaper guesthouse). I was traveling with my good friend from Paris, photographer David Luraschi. Just 2 days before arrival, we reserved our 4-wheel-drive rental car (this is the only thing we needed to have pre-booked, and we actually should have reserved our car sooner, because last minute options were limited and many rental car agencies were sold out of cars). There was just a little hiccup at the airport in Paris; we only possessed one-way tickets to Muscat and were forced to buy a return flight on the spot (it’s required by the Oman gov’t that tourists posses a return ticket upon arrival. We were unsure of how long we wanted to stay in Oman and planned to book our return ticket later.) Thanks to horribly slow internet on our phones, we almost missed our flight before managing to book an expensive refundable flight (which we cancelled the next day). With that stress out of the way, it was all clear sailing from there. The 7-hour flight with Oman Air was super comfortable. Getting our tourist visas and sim cards at the Muscat airport was a breeze (the airport is very sleek and modern). A rental car rep picked us up at the airport and renting our Nissan Xterra was super easy (no international drivers permit necessary). We used Google to navigate across Muscat to our hotel (the roads are very well kept and drivers are civilized). Checking in to our luxurious mega-corporate chain hotel… flawless. When traveling to Paris and onward to Oman, I checked in most of the camping gear we would need; ultralight backpacking tent, sleeping pads, sleeping bag, ultralight chairs, jet-boil stove, and some freeze-dried meals. As I’ve recently gotten into ultralight backpacking, all of my camping essentials are compact and weigh under 10 lbs, so packing them into my checked luggage was easy. Once in Muscat, we did a few grocery store runs for water, gas canisters, firewood, a cooler, camping friendly food, and cleaning supplies. I wanted our car to be stocked to where we’d be self-sufficient for several days, as I had no idea what the availability of groceries would be like once we left the city, or whether we’d be getting into some wild terrain that could leave us needing to fend for ourselves. After two weeks of road-tripping around Oman, I found the country to be more developed than I expected, with gas stations and grocery stores pretty easy to come by. If you are between the big cities in the north (Muscat and Nizwa and Sur), there megastores Carrefour, The Sultan Center and Lulu Hypermarket (these stores are like Walmart SuperCenters, where you can get everything from groceries to electronics to camping gear). Once you venture further south, things get a bit more rural, but there are still small grocery stores and gas stations. We were surprised to find one of the better stocked grocery stores at our furthest destination on the trip, Masirah Island. Without the slightest idea where we were going to sleep that night, we checked out of our hotel and started driving. We followed the coast to a place called the Bimmah Sinkhole, a very popular swimming spot among both tourists and locals. The limestone sinkhole is 600 meters inland from the ocean and filled with turquoise seawater. Even with January temperatures at their most mild for Oman, the heat of the day was still 80°F… the perfect temperature for a refreshing dip in the sinkhole! 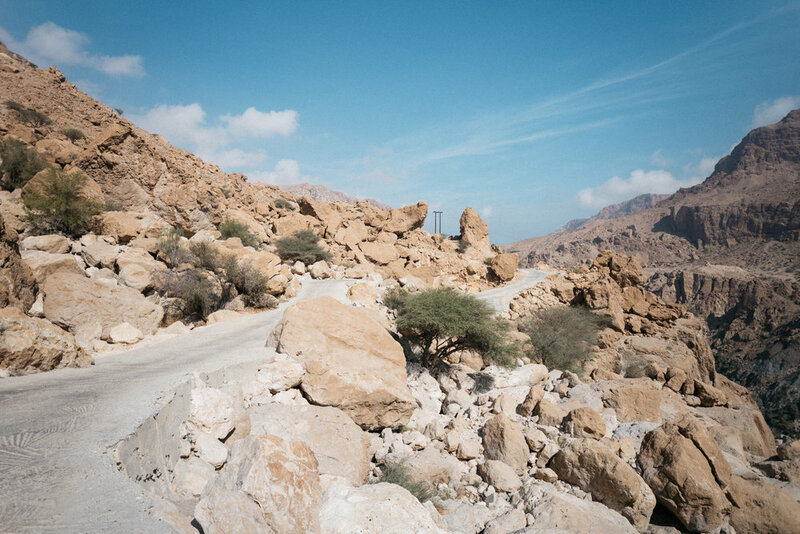 Although not the steepest stretch of the road to and from Wadi Tiwi, this photo shows you how narrow and winding the road is as it climbs the hillside, swerving between boulders. After the sinkhole, our next destination was to our first “wadi”, Wadi Tiwi. Wadi in Arabic translates to “valley”, but usually refers to a river that flows through a canyon, creating a fertile oasis for date palm trees to grow and for local villagers to farm. Wadis are also an oasis for swimming, with crystal clear turquoise freshwater pools that are perfect for swimming and diving. I love swimming holes, and I seek them out around the world, and Oman has some of the dreamiest. While driving down a VERY steep and very narrow road in search of Wadi Tiwi, a local boy flagged us down and asked for a ride. His name was Rashid, and he was very friendly, and tried his best to talk to us, despite not knowing any English and us only know two words of Arabic. When we reached Rashid’s village, he and another friendly resident led us down a labyrinth of terraced gardens and makeshift pathways to the most incredible canyon, creek and waterfall. The sun was setting at this point, and Rashid and the other man kindly showed us a secluded (and conveniently well-paved) area on the rocks where we could set up camp for the night. It was a dream of a campsite; situated right above the canyon and creek where we could fall asleep under the date palm trees to the sound of rushing water (and startling donkey calls, too, as it turned out). Rashid, who caught a ride with us, and then showed us to this wadi. The next morning we woke up to a slow sunrise in the narrow valley, and then made our morning coffee and tea (quickly and easily with the Jetboil I had packed from the states). David and I scrambled down the creek to a lower waterfall where we had a leisurely swim (which served as a nice substitute for a shower), before packing up camp and making our way back to the car. This was following our first night camping in this new and foreign country, and I’d be lying if I said I wasn’t unsure about whether to expect our belongings and car still be there when we returned. It took a few days for our worries and fears to melt away, as we developed an understanding of how safe and friendly a country Oman really is. Our plan was to continue to the town of Sur, but being a large developed town, we couldn’t find anywhere worth setting up camp for the night. We decided to drive back towards the Wadi Tiwi, where we had seen a large stretch of coastline where there had been people camping. We staked out an isolated spot with a panoramic view on the edge of a cliff, overlooking turquoise water and a white sand cove. As night fell, our eyes were drawn to a dancing blue glow coming from the cove below. There were bioluminescent algae being activated by the movement of the crashing waves! Each time a wave would form and break on the beach, an explosion of blue particles would be illuminated! We saw a speedboat passing on the horizon, leaving behind a glowing blue trail in its wake. This was David and my first time ever witnessing bioluminescence, and the sight took us completely by surprise. We attempted to capture video and photographs of it, but we really didn’t have the right long-exposure photography tools to adequately capture the magical scene we were seeing with our eyes. In the morning we got up bright and early to visit Wadi al Shab. This wadi is probably the most visited of all of the wadis, and we got the tip to arrive there as soon as it opens, at 9am. This wadi is not one that you drive into, and instead you park and take a short boat trip across the river and then hike in a mile or two deeper into the canyon. Here there’s a small beach where you must leave your belongings behind to then swim upstream to a series of swimming holes, and a very cool cave with a waterfall inside. Wadi al Shab was paradise for swimming, but since the canyon is so narrow, it was not home to any villages like in Wadi Tiwi. Shortly after our arrival the wadi quickly filled up swarms of tourists, most of them from Western Europe. David and a local boy on the beach. Around them are the tracks of sea turtles that had come to nest in the night. The next two nights we took the advice of some local fishermen and set up camp at this small, vacant beach. We loved this spot so much that we stayed for two nights, swimming in the warm Arabian sea, and watching the local fishermen coming and going. This spot had the most gorgeous sunrises, and each night we would walk along the bioluminescent shoreline, and the particles would glow brighter under our footsteps. We learned that this area is near a breeding ground to sea turtles, and you could clearly see their tracks in the sand. A sign in the area warned not to make campfires on the beach, so we were sure to not do so, and we were extra careful to leave no trace. We learned that the turtles are very sensitive to disruptions in their nesting environment, so in hindsight, we should have camped on the rocks above the beach and not on the sand itself. We were sad to leave the beaches and wadis, but wanted to check out the rolling dunes à la Lawrence of Arabia. 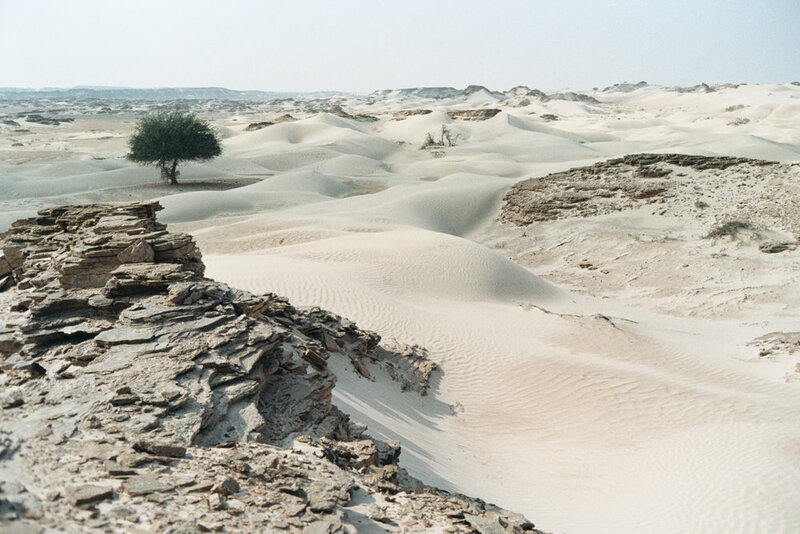 We had been given a recommendation to check out the Al Khaluf white sand “sugar dunes”. The dunes were a several hour drive south, and we took the scenic coastal road. The map didn’t suggest there would be anything along the drive, so we were surprised to pass through several populated towns before crossing a long barren expanse of desert before arriving at the dunes. At this point we had no experience driving on sand, so we hesitated to drive very deep into the sand-scape to where we told there would be the most impressive white-sand dunes. When driving very far off-road on the sand dunes in Oman, it is recommended that you take a caravan of two or more vehicles in case you get stuck. We found a nice place that was not too far off the road to set up camp in the dunes. At this point you might be wondering “where in the world did you take showers and use the toilet”? This is actually a great question, because when I travel I very much abide by the Leave No Trace principles about impact, garbage, and doing my business. So there are actually quite a few roadside restrooms on the roads in Oman. These are clean restrooms with running water, flush toilets, a person on staff who maintains it. There was one of these at Wadi al Shab, and at random spots along the roads, which was very convenient for using the toilet, brushing my teeth, and even rinsing dishes from time to time. When we were in the Al Hadd area, we went to the Ras al Jinz Turtle Reserve visitor center to use the cafe, toilets, and free wifi, as well as to charge our devices. We actually spent quite a lot of time there, and nobody seemed to care (Omani people are too polite!). Masirah Island was the best part of my whole two-week trip to Oman. It wasn’t sights or swimming that made Masirah Island unforgettable, it was the friends that we made. David and I decided on a whim to come to Masirah Island. We hadn’t heard or read anything that made the island sound extraordinarily appealing; all I knew was that it’s sparsely populated, looks sort of barren and moon-like, is good for camping, and has a nice coastline. Since we wouldn’t be able to go as far as the southern region of Oman on this trip, I was interested in taking a detour from the more commonly visited northern region, to see what the country’s largest island was like… and “moon-like” had my curiosite piqued! We left Al Khaluf and navigated to Shannah ferry port, and made it within minutes of the ferry’s only departure for the day. Within minutes of arriving on Masirah Island, two young men named Mohammed and Harith stopped to say hello, and we spent the following 24 hours on the island with them and their friends; visiting their favorite beaches, their family camel and goat farms, they hosted for us a beach barbecue, and even invited us to stay the night in their home, where their family served us breakfast in the morning. So we didn’t wild camp in Masirah Island OR the night after we left Masirah Island. On the island we stayed in our friends’ home, and were very happy to have a warm shower after a windy night in the dunes (we had sand everywhere). Our next destination, Wadi Bani Khalid, was a long drive away, and seemed to be in an area of less scenic highways that didn’t present very good options for camping. That night we stayed in a budget hotel called “Oriental Nights Rest House” so that we could get up early, before the crowds, to visit Wadi Bani Khalid. We were also able to have our laundry washed at the hotel which was a real luxury after a week of living on the road!